I’m always amazed with gluten free baked goods that don’t seem to be gluten free. 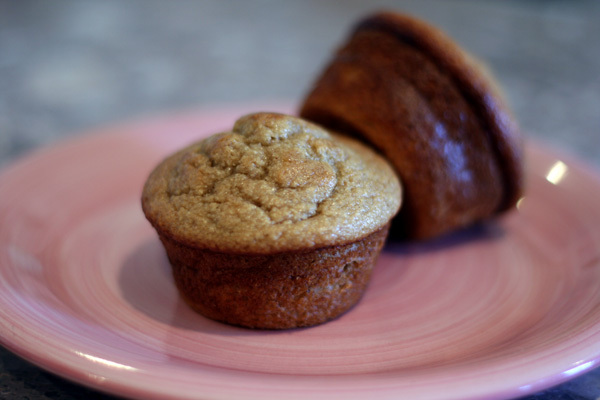 No weird texture or taste with these Gluten Free Banana Oat Muffins. You seriously wouldn’t even know these Gluten Free Banana Oat Muffins were gluten free just by tasting them. These couldn’t be easier to make! Just throw it all in the blender then bake. Notice in the directions that it says to use silicone or foil muffin liners. Don’t use papers liners as they don’t work so well with gluten free foods. I really love the silicone baking liners. They amaze me! I’ve tried using other silicone bakeware, but haven’t liked them because they are super floppy and can make a big mess. Prepare a 12-cup muffin pan by spraying with non-stick spray or lining with silicone or foil liners. Blend together oats, yogurt, eggs, sugar, baking powder, baking soda and bananas together in a blender or food processor. Bake until a toothpick inserted in the center comes out clean, about 20-25 minutes.